A half-iron distance race held by Dengie Events in the East of Essex in the small village of North Fambridge on the 2nd June this past weekend. This was a planned event on my race calendar, a chance to assess my training in an early race for 2013. I think I am left with more questions than answers for myself as I work my way through my own self-analysis with the very welcome input from my friends who know me and/or train with me. So without delay, race report, here we go! No trouble here, registration is painless, and easy to find the day before race day. The cycle course was signed the also on the day before race day, so if you were particularly conscientious you could drive the cycle route. After having had a long drive with kids and dogs, we skipped a complete recce after driving 10 km around the cycle course. The race organisers were faultless, with chip timing, photo’s of the event (average), and triathlon equipment vendors on hand. A festival like atmosphere around the race HQ on the race day, especially so nearest the local pub. The swim was a bracing affair at 13.5 C , this is we were informed, 0.5 C above the BTF legal requirement for a triathlon swim. The swim is held in a tidal estuary so the water is sea water, and there is notable current to speak of.. When the swim started the tide was pushing very strong into the estuary meaning that one had to adopt a casual backstroke or breath stroke to stay in place on the start line. The run down to the first turn was with current and would be quick but after turning be against the tide coming back would separate the men from the boys, two laps to complete the course. The water temperature was actually not too bad after a few moments. For my part I set off at my normal lazy swim start pace. I noticed that everybody seemed to be swimming like crazy for the first couple of hundred meters, I take a non rushed approach to the washing machine. After the first couple of hundred meters most of the crowd had disappeared and I was what felt to be ambling along in a slow warm up stroke (am I learning to pace?). My strategy was not too burn too many matches on the swim and save most for the bike, as historically my swim is fairly strong. I found the front of the pack moving along steadily and came out 5th with the lead group bunched ahead of the main back. I loved running out the water after a nice swim in the sea, it always puts me in a good mood the sea I think. I got to wave and shout to my wife and family. Luckily they didn’t see me run past my bike in transition like a fool (something’s never change). The wetsuit came off quickly without pain, it is clearly getting nicely stretched out now after a few years use. The bike course I’d characterise as rolling with a few hills (sharp climbs) along the way, but the headwinds make for some work, and cross winds equally trying. I think this is part of the courses charm year-on-year. I had mentally set myself the target of hitting the cycle on 3 hours or less for the 90km. This translated to an effective 30km/h average. This also means on the cycle that I need to ignore those with wonderful cycling ability who rocket past me after the swim. Sadly I cant keep up – yet! While I hit my time target, I don’t think it was error free, towards the end of the bike I was starting to feel tired. And I had to relieve the start of back pain more than once by ‘getting out aero’ and standing up on the pedals, this I think is an expensive remedy, both in terms of time, energy and impact on the quads. I was very impressed with my dismount off the bike, shoes left behind on the bike like a pro! One would almost think I had practised that loads. I ran into transition to find my family waiting for me, for some cheering on. I was still feeling good. The run is a 18 km half marathon off road/road mixture around farm lanes and farm fields a few places where ankle turning is a strong possibility, and a small set of stairs on the course to boot too. Four laps of this which includes running through the village and the Yacht Haven Race HQ. I hit the run fairly confident, I had practised a few bricks etc and hoped to keep up a circa < 5’00/km pace. However after the first 4 kilometres my pace began to drop off quickly. There seemed to be less and less energy coming out, and maintaining the pace became hard work. My heart rate was still in the 85% or so of my range where I normally train but instead I was achieving a snails pace. The run progressively became harder work to the point I was relieved when the run was over. Very frustrating since I run the half marathon distance weekly without any great stress or effort on fairly hilly routes (normally at around 1h37). So I would have hoped for better perhaps than the 1h47 I managed. Quite a bit off my target for the year, but we’ll see how things mature. My pre-race nutrition was not brilliant and I think I should have probably got a little more eaten on the bike early on. 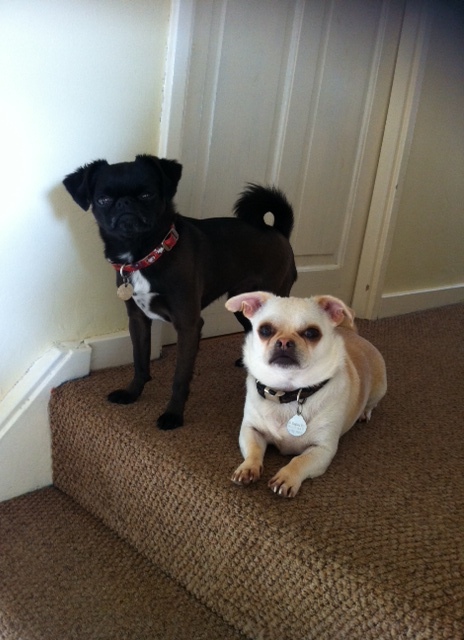 Sadly the dogs King and Romeo are banned by my wife from attending any more races in the immediate future. This is down to King’s short-man-complex which leads him to view any other dog, cat, postman in the area as being in need of intimidation. Romeo unfortunately end’s up banned by association, despite being a pacifist. Doubly a pity since they both love staying in hotels when we go away (particularly riding in the elevator) – sorry boys!